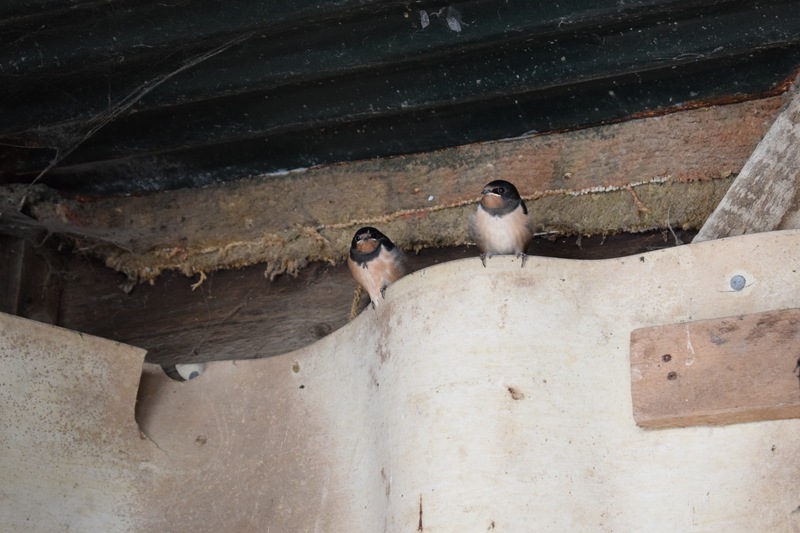 We’re lucky that there is a thriving population of swallows in our village – they nest in local farmyards and stables where there is a ready supply of nesting material and insects. Just up the road from us is a smallholding of Shetland ponies and goats where over 30 swallows have fledged this year from 4 nests. There is a second brood in one nest and although the babies are flying, they still have the yellow edges to their beaks and fluffy feathers. They seemed completely unperturbed by me when I took these photos; if I’m going to be anthropomorphic, I’d say they were watching me with interest 🙂 I got within a metre of them and it was only when I lowered my camera that I noticed another one perched close behind me. It chirruped and took off, flying over my shoulder and out through the door, up into the sky. Hopefully, they will all be fully fledged and strong enough in time to survive their long journey south. We will be waiting for them to return next spring. Gorgeous – not something I get to see too often here in Los Angeles. Thank you for sharing! They are a joy to watch, aren’t they? How wonderful to get such a close-up view of them. As you say, the Earth continues to do its amazing thing with it without us. How lovely to see Bewick’s – they’re my favourite swan. It is all glorious, you’re right. I love swallows and sadly there are many less than there used to be around here. I remember telephone lines of dozens, now we’re lucky to see half a dozen at a time. Your photos are charming! I haven’t seen a swallow for years. Thank you for the post and the photographs. Lucky you to get so close; ours always nest high up. When I was a child in England, our dog used to run herself ragged trying to catch the swooping sunset swallows… I miss them here in Australia. Thank you for the amazing pics! Amazing photos! I love swallows, all birds really. 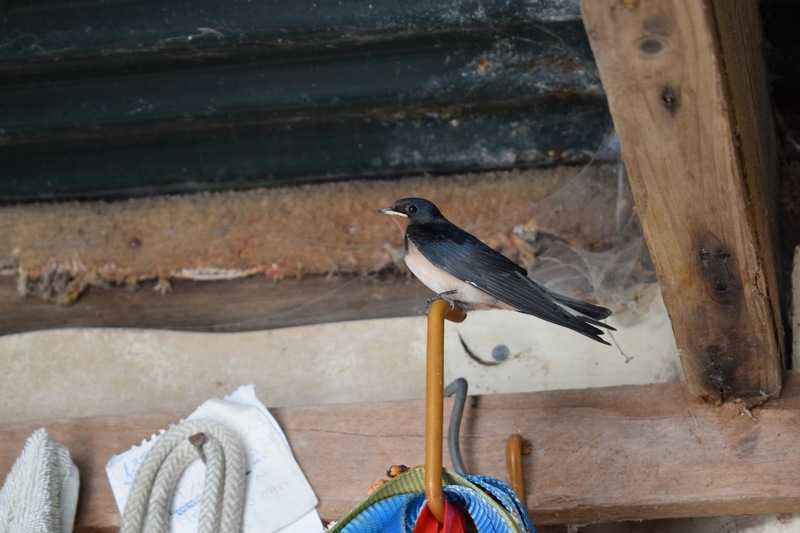 There are not so many swallows here, maybe the conditions are too rough. On the grounds of my childhood holiday house in Northern Italy there were many nests and I remember watching the nestlings grow up and fly the nest. Swallows are so graceful, swooping over the landscape. Beautiful photos. Great photos Sam. I hadn’t realised before how thick their white under eyeliner is. Almost anime! I’d say those little ones were watching you with interest! I adore swallows. Watching them wheel around our sky, with their musical talk, makes me thrilled to be alive. 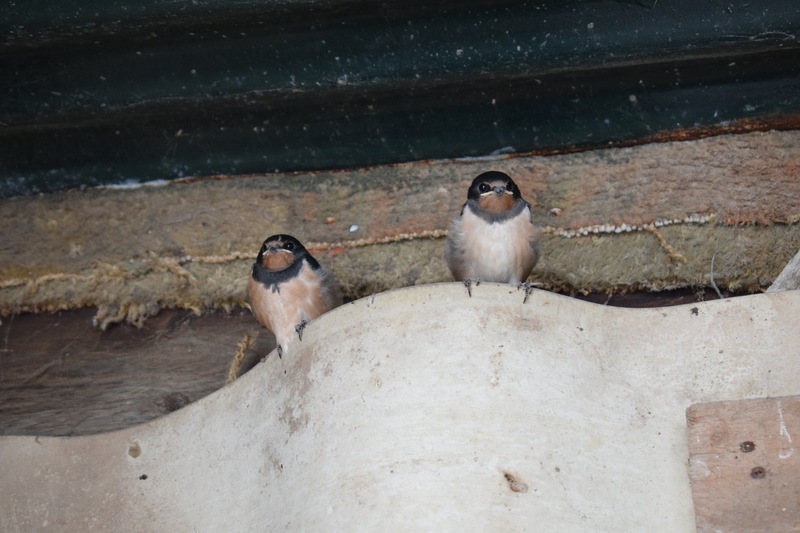 Seeing the first flights of a swallow fledglings has been a highlight of our life here–such exhilaration in discovering what it could do. Unfortunately, the aggressive male bluebird that moved in here midsummer chased away our swallows. Little beast! 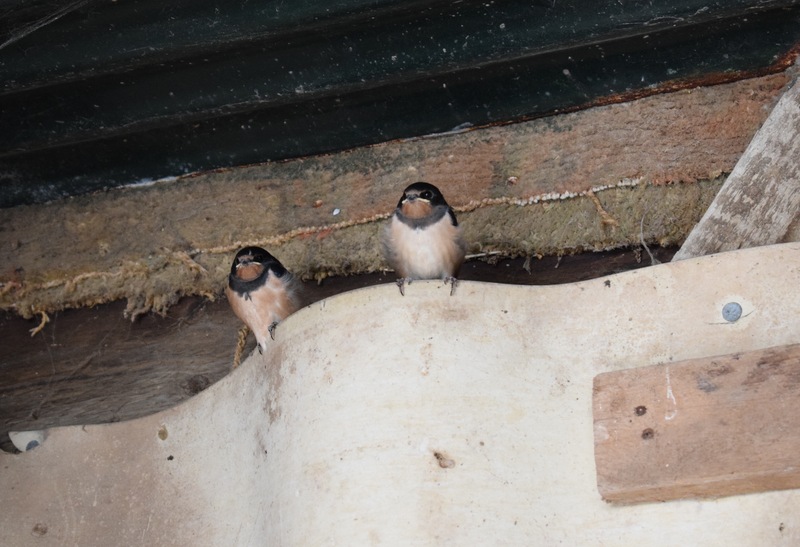 So, it looks like we will have to take down our nesting boxes this winter to see if he will move on and we can bring the swallows back. Bluebirds must be v territorial. Hope you manage to get rid of him and tempt the swallows back next year. We recently visited some friends, there ‘hundreds’ of swallows gathering on the phone lines, it is amazing to see. 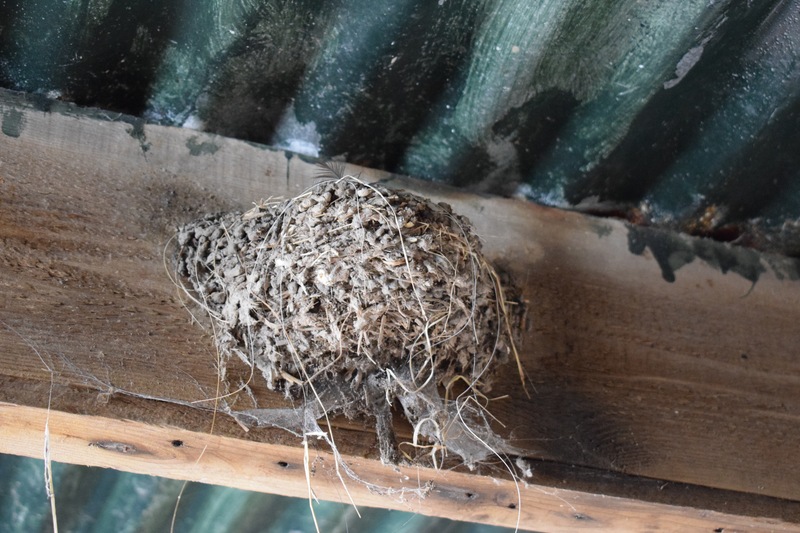 I do worry about the loss of nesting sites as more old barns and farm buildings are converted to housing. I shall look out for the swallows. 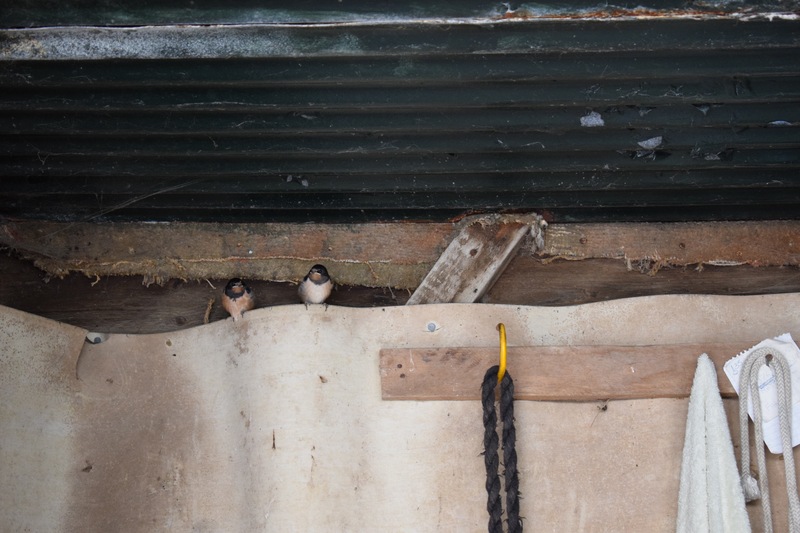 Last year there was a pair thinking of nesting in our neighbour’s carport. Love the photographs of the nest and young swallows. We don’t see them in our neighborhood as there isn’t enough open space – but there are areas nearby where you can watch them in flight. The Chicago Botanic Garden has lots of Swallow houses to make their lives a little easier.